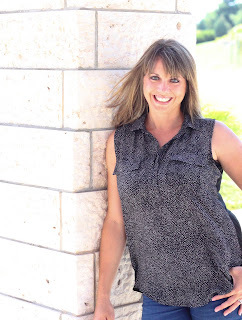 Planning special moments or occasions does not have to take lots of time, energy, or money. I planned this special breakfast the day before Valentine's Day with things I had on hand at home. It's easy to get wrapped up in the Pinterest/Instagram culture and to let all the beautiful images of table presentations and decorations leave you feeling that you cannot measure up. But the only one putting that pressure on you, is yourself. Kids find the most simple things fun and exciting. Keep the who and the why in mind. Who are you trying to impress and why are you trying to make this a special occasion? For me, I wanted to make a special breakfast that was out of the ordinary to show my little loves how much I love and adore them. 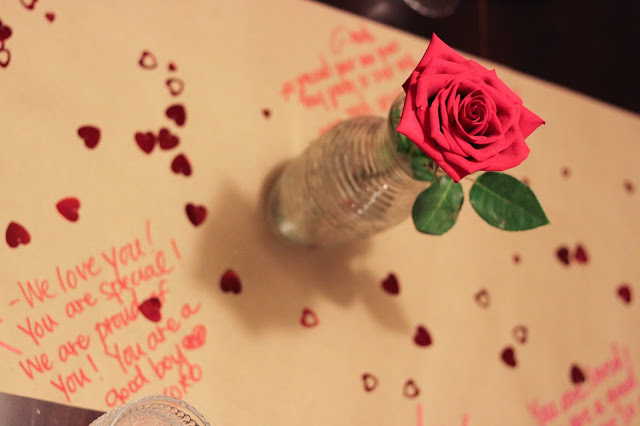 As my boys came downstairs Valentine's Day morning, the delight on their faces was so rewarding for me. It didn't take much to make a special day even more magical with a fun breakfast. I prepared our favorite pancake recipe, this one which is a copycat of the delicious IHOP pancakes. A little tip for you, you don't even have to buy the buttermilk. You can use 1 tablespoon of lemon juice combined with 1 cup milk as a substitute for 1 cup of buttermilk. To make the pancakes a little extra special, I cut up some strawberries and had whip cream available as toppings. Strawberry milk rounded out our special Valentine's Day breakfast and was a huge hit with my milk loving boys, and fit in perfectly in the red/pink theme I was going for. 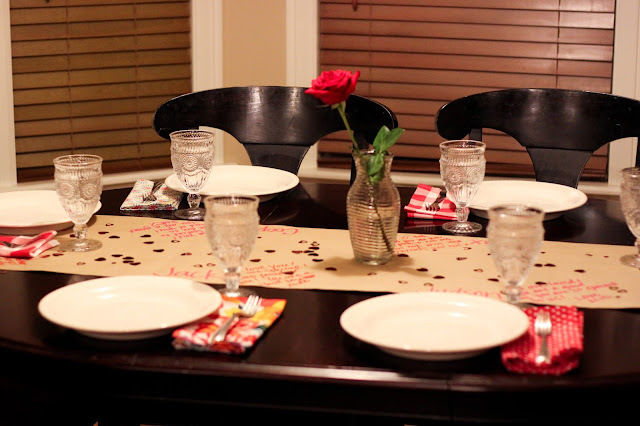 I cut a long sheet of butcher paper off a big roll and taped it down under the table as a table runner. I wrote each of my loves a special note, and spread some heart sequins I had on hand from a project last year (this is where being a saver comes in handy)! 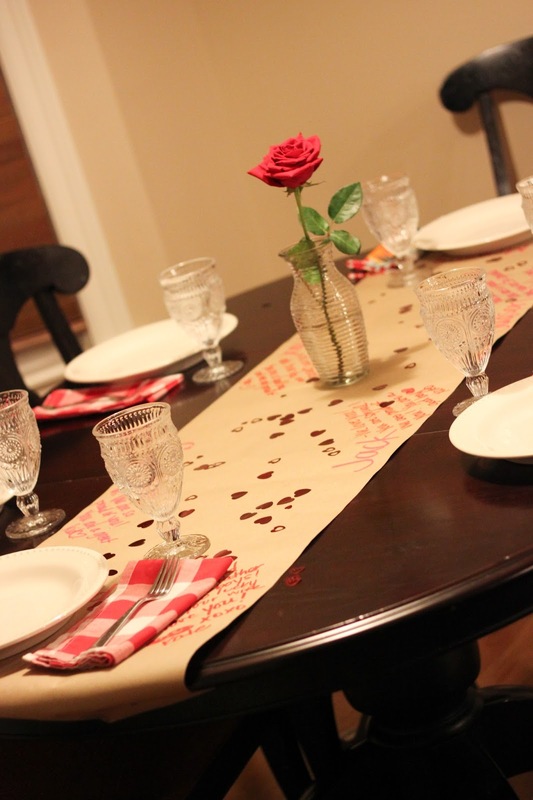 I was excited to use cloth napkins in hues of red to dress up the table. My four year old, Jack, exclaimed, "This is the best dinner ever!" So while it would never earn many hearts on Instagram or pins on Pinterest, the accolades of my four year old son is all the praise I need. Making things special and fun for our kids doesn't have to take much time, money, or planning! I am thankful for that. Kids love when we do anything fun and different to make things special. See how creative you can be with things you already have on hand at home and get out there and make some memories. How about you? Do you have any quick and easy tips for creating special moments? I bet your kids loved this!! The little notes on the runner are so special! Such a great idea!